Arayo's Ride: EVIL Toads of Kansas! EVIL TOADS! Yes, you heard me. Those cute fat lumpy little toads that hang out in your garden. BAD news, these guys…..
Now, most of the summer one stalked us. I just thought it was really stupid - maybe brain damaged from lack of water and too many 100+ degree days in a row. Every time I walked out the back door the fat little guy was waiting. Perhaps for an invite inside and a fresh drink of water…. I didn't know. I'd chase him a bit and get him to take a couple hops. Then he'd stop. I'd grab a broom and gently coax him towards the garden. Cute. Fat, lumpy cute. Arayo thought so too. She thought this was better than a squirrel. I had to be on alert or she'd dash after it and I wasn't so sure that Lumpy could out-hop her. But, with the changing of the seasons, Lumpy hasn't been around so I assumed he'd gone the way of mosquitos - who knows what happens to them in the winter? Maybe he'd hopped to Mexico. Last night I took Arayo out for a potty break. As we were coming out of the house she dashed after something. I grabbed a post that is by the back door and halted her progress - then decided to walk her around the house in a different direction from whatever had her interest. Business done, we returned to the bedroom. Arayo turned to face me, lowered her head, S-L-O-W-L-Y opened her mouth and out falls this gray …….. blobby thing! OMG! OMG OMG OMG! I'm chanting as I race from the room for a dust pan. This THING has a familiarity about it. Could it be…..? THE TOAD! Lumpy is back and Arayo has been carrying it around for 5 minutes or so. I scoop it up and rush outside. It doesn't look harmed but it is solid as a rock - not moving a muscle. Dead? Shock? I toss it into the garden and return to Arayo who is now standing by her favorite drinking fountain - the bathtub - but I realize she is foaming at the mouth! A drink of water and I'm back to the computer. I know that killer toads are to be found in places like Central America, but why is she literally foaming? Warning Toads have enlarged glands (called the paratoid glands) on the side of the neck, one behind each eye. These glands secrete a viscous white poison that gets smeared in the mouth of any would-be predator, inflaming the mouth and throat and causing nausea, irregular heart beat, and, in extreme cases, death. 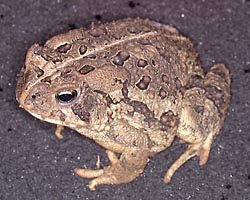 Toads pose a danger to pets, which may pounce on and bite them. I call the vet who happens to be in the office at 10 pm. "Well, there isn't much we can do for her but her size is a plus. Give her some hydrogen peroxide, get her to vomit and call if she develops any problems." I'm off to the bathroom to grab the peroxide, then to the kitchen. I need to concoct something to get this down her… I find stale Lorna Doones, a box of old saltines, a package of chopped hot dogs. Everything gets mushed together and soaked with half bottle of hydrogen peroxide. I get "the look" - like "are you serious?" Arayo eats it anyway. Some days I'm REALLY glad she'll eat almost anything. We head outside to see if she isn't ready to barf, but not a chance, so I repeat the process and we walk some more. An hour and a half later, we are back inside. She isn't feeling great - her green squeaky razorback is being carried around while she cries a bit. I've covered the bedroom floors with blankets and plastic and she finally settles down - but I hear her stomach rumbling……. She rests until about 12:30…… Then, out of a corner of my eye, I see this enormous yellow foamy mass slowly ooze from her mouth - mushed up Lorna Doones, Saltines and weenie hunks. A teaspoon was on a blanket - the rest on my newly shampooed carpet! It was special. But, finally we could both sleep. She seems fine this morning but I've learned my lesson. Beware the fat cute lumpy stupid frog. He's not as innocent as he appears. Cute telling of a gross story! Glad she's ok now. Sister Emily wishes you & Arayo a Merry Christmas! Janet H.
Oh my! What an adventure for you both, although now I think I need to hurl. Ewwww. So glad you both are okay! We are so glad both of you are okay and have fully recovered. There's never a dull moment, is there? This story adds the ewww factor, too, sorry about your rug!